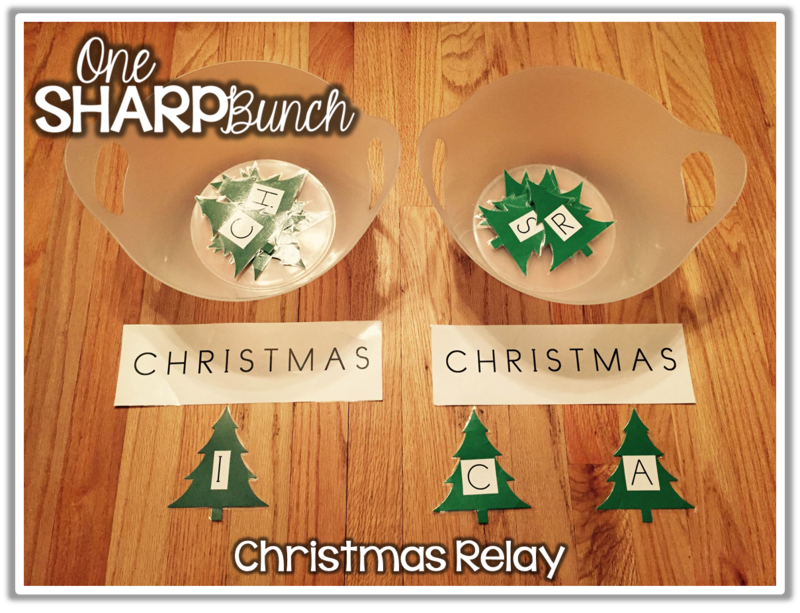 I started pulling out all of my holiday party games and crafts this past week, and thought I’d share them with all of you! Our party will be on Thursday, even though we do have school on Friday. We do this because there have been years where we’ve had a snow day on the last day before Christmas break and had to cancel our parties…. and it is terribly disappointing to the kiddos, especially after all of the planning that has gone into making our parties perfect! My holiday party takes up about two hours. I set up six stations – cookie decorating, two craft stations, and three game stations. 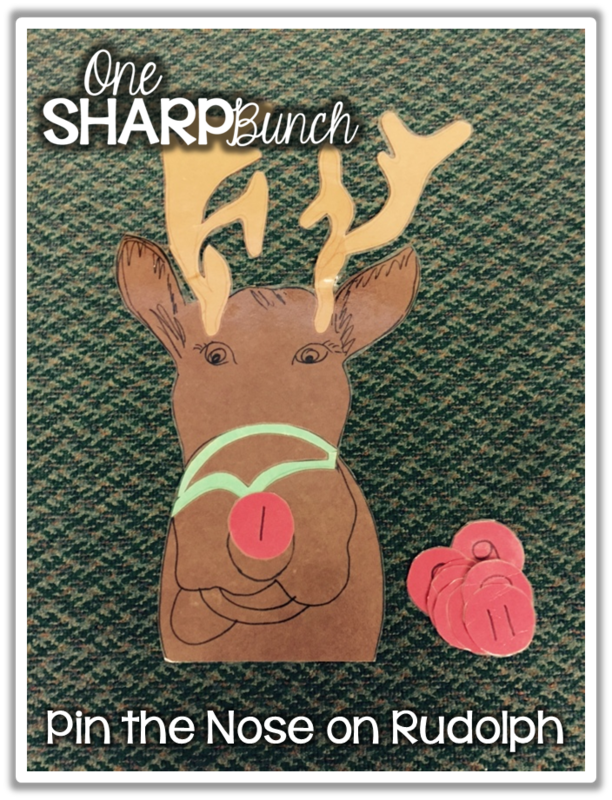 Here’s a sneak peek at our crafts and games! 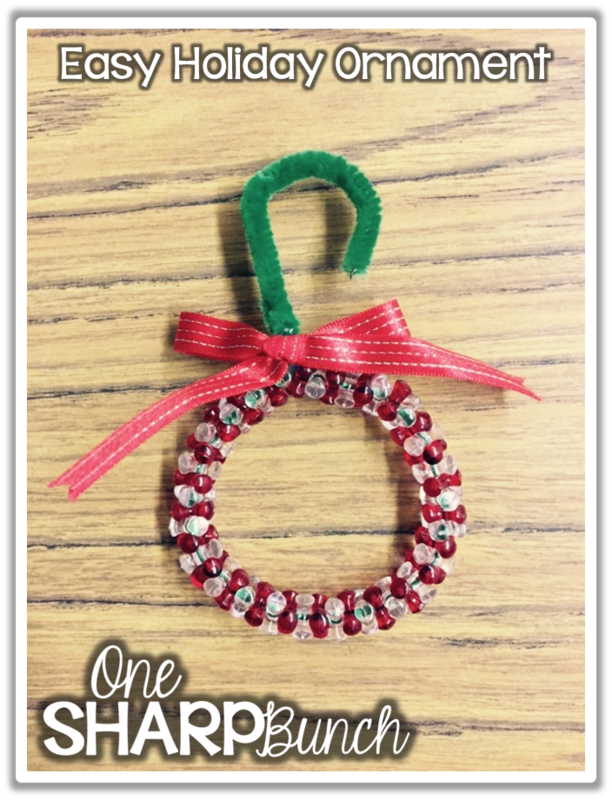 We make an easy holiday ornament and practice our patterning skills. I have a parent pre-bag the beads into Ziploc baggies containing 25 red and 25 clear beads. I also pre-tie the bows, so that all we need to do is hot glue them onto the wreath. Simple, yet educational! At this station, we practice our measuring skills by making magical reindeer food. I place a few 1-cup measuring cups and 1-tbs measuring spoons, oatmeal, and glitter in the tub. The kiddos will measure and place one cup of oatmeal and one tablespoon of glitter into a Ziploc baggie. Then, they zip the baggie and shake it up. 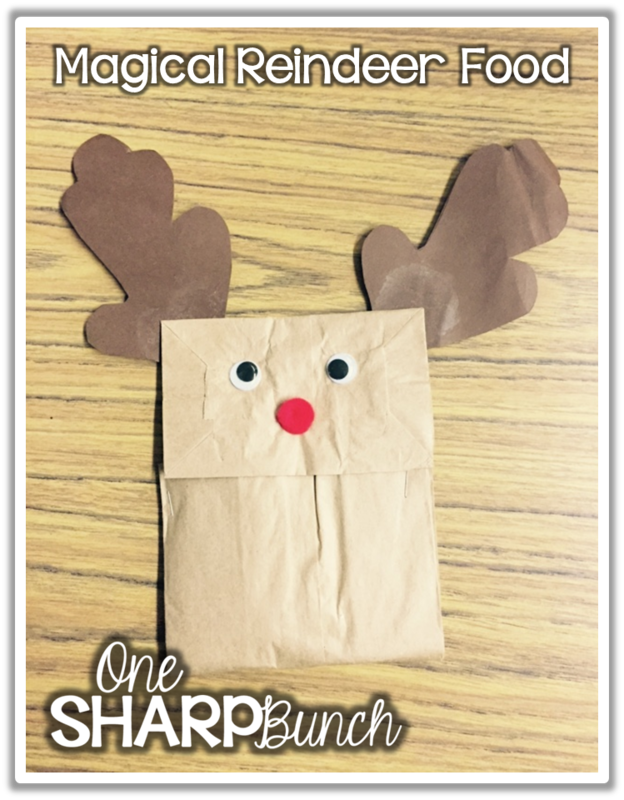 You can’t see the baggie of magical food, but it is inside the reindeer bag with a little poem. I whipped up this fun little game my very first year teaching, and it is still in great shape. Plus, easy to store away. The kiddos love it! Just grab a tri-fold board, illustrate your picture, trace a circle, and cut it out with an X-acto knife. 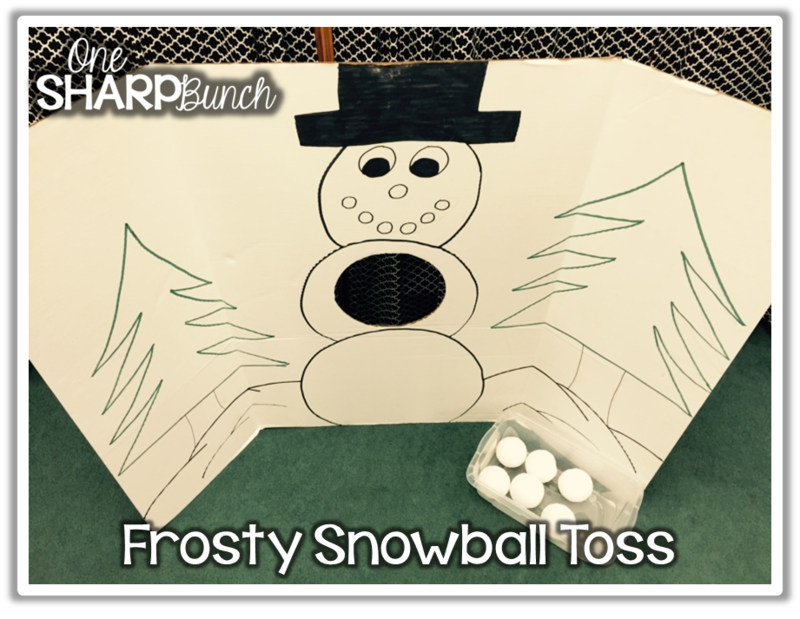 Then, get yourself some Styrofoam snowballs, and PRESTO – you have a fun Frosty Snowball Toss game! Now, I can’t take credit for this fabulous creation. The art teacher at my old school drew this reindeer for me during my first year teaching (many, many moons ago). I laminated him for durability, and store him in a flat drawer until party day. This is one of my, as well as the kiddos, favorite party games! First, I measured how tall and long I needed the construction paper, so that it would wrap around a 2-liter bottle. Next, I used a black marker to draw on the eyes and mouth. Then, I laminated the paper faces to prevent ripping. I secured the faces to the bottles using packing tape. Tape one edge of the paper to the back of the bottle. Wrap the paper around the bottle, and then tape that edge down. The hats were made with black foam, while the noses were made with orange felt. I simply hot glued them to the bottle. Just a little fyi… the noses do fall off from time to time, but I just re-glue them. Next time, I may just draw the noses directly onto the white paper using an orange marker. My kiddos can’t get enough of relay games! This game is a great way to practice letter/sound recognition. I used our Ellison machine to punch out the Christmas trees shown below. Then, I glued a letter on each tree, and of course, laminated for durability. If you don’t have a Christmas party, you could easily use snowmen or snowflakes to spell the words “Frosty,” “snowflake,” “winter,” etc. The bowl of letters are placed at one end, and the word is placed at the other end. I (and by “I”, I mean my parent volunteer), divides that group into two teams. The first person will grab a letter from the bowl, bring it down to the end, and then come back to tag the next person. Once all of the letters are at the end, that team works together to spell the word. The first team to correctly spell the word wins! For a more challenging game, remove the word card. This game is by far the easiest! 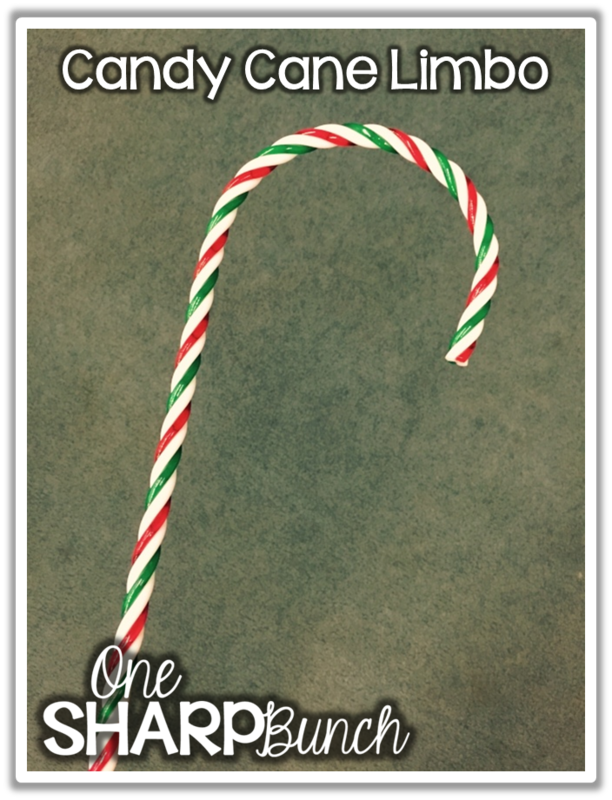 Just grab a plastic candy cane from Wal-mart or the dollar store, and you have yourself a Candy Cane Limbo game. I just love watching the kiddos limbo! Cracks me up every time! Now, I know I said “8 Easy Holiday Party Ideas.” We do play one more game. It’s a snowball relay, but I forgot to take a picture. I will explain it the best I can! It’s super simple. You will need two Styrofoam or plastic bowls for each student in that group. Fill one bowl for each student with ten cotton balls. These bowls will be set up in a row at one end of the rug, room, hall, or wherever you are playing. Place the empty bowls at the other end. The students will use a plastic spoon to scoop out one “snowball” (aka cotton ball) and transfer it to the empty bowl. They can only use one hand. If they snowball falls off, they take it back to the beginning and try again. The first person to get all of their snowballs to the other side wins! Check back on Monday for a picture. The only planning I do for my party is to organize the donations. I send home a party letter about two weeks before the big day asking for volunteers and donations. Then, the day before the party, I organize all of the supplies and games into six station tubs. I have been using the majority of the games since my first year teaching! I simply tuck them away for safe keeping and pull them back out a few days before the party. Easy peasy! 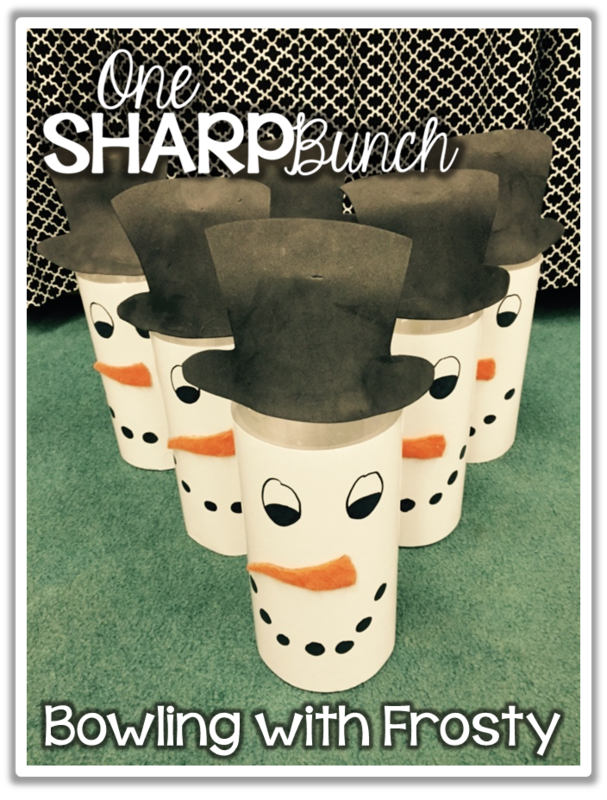 I hope you found some holiday party ideas that you can use at your own party! Only one more week! WE. GOT. THIS. Thanks for sharing this wonderful post on holiday party. Even it’s a best idea to play games on Christmas and New Year party. I like 8 ways that you have shared to make our party best. I will use all of these ideas to make my party perfect in any way.